What is the Propeller Platform? One development board I recommend is the Propeller Platform DNA from MGH Designs. This is currently my favorite development board as it includes a built-in μSD card socket, a 5 volt regulator, easily accessible pin headers, and the ability to be powered directly from the USB programming connection. Detailed information can be found be found here. This board has a long history. The first version, originally developed by Gadget Gangster, offered a versatile platform for easy prototyping. Later revisions made the board a little more compact without removing functions or changing connectivity. The purpose of the Propeller Platform was to provide an open-source, user-friendly development board that was already equipped with the most useful features. Additionally, it was designed to be expandable through removable shield modules. This basic design of the Propeller Platform is similar to the popular Arduino microcontroller, and allows for 'plug-and-play' prototyping. (Note that an Arduino-form Propeller board created by MGH designs is also available and is compatible with most Arduino shields.) The design of the Propeller Platform modules was also made publicly available, further spurring community-driven development. Modules included gaming systems, motor controllers, LCD interfaces, touch screens and more. Unfortunately, most of these modules are no longer available, however the open-source design of the Propeller Platform allow anyone to develop their own version of many of these modules. 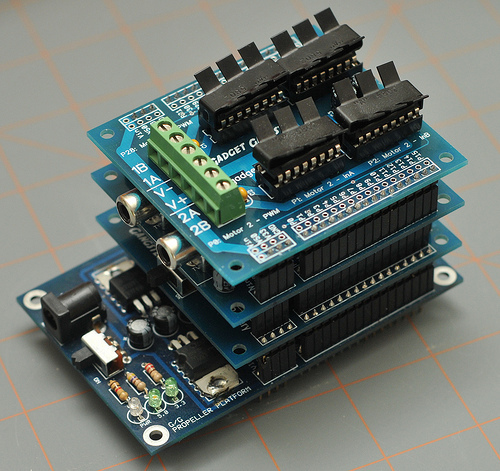 The original Propeller Platform, with a battery module, audio/video module, and motor driver module stacked together. Gadget Gangster and Parallax later shifted focus to the Quickstart, and stopped selling the Propeller Platform, and then Gadget Gangster closed. Fortunately, as the design was open-source, several individuals created revised versions of the Propeller Platform. MGH Design's Propeller Plaftorm DNA is one of these revisions. Another more recent edition is the Propeller Platform Express from Ray's Logic. I prefer the Propeller Platform DNA, so I will continue referring to that version of the Propeller Platform. However, any instructions regarding the DNA are also relevant to other Propeller Platforms. Although there are slight differences, all versions of the Propeller Platform are compatible. Two versions of the DNA are available. The basic version is suitable for most needs. A slightly more expensive version is available with a real-time clock circuit (RTC). The RTC provides many benefits but it is not required for the DNA to be able to keep track of time. Currently, you can obtain the basic DNA board from MGH Designs. The purpose of leaving the female pin headers uninstalled is so that the user can decide how to set up the DNA in their project. In some cases, the user may not even need the pin headers; jumper cables can be solder directly to the DNA board. In other cases the user may want to install the pin headers facing downward instead of installing them in the traditional upward facing position. The user can also install different types of pin headers. Typically, I install the female pin headers facing up in the outer rows. This is very useful for prototyping. For example, I frequently use male/male jumper cables to connect the pins on the DNA to a bread board. It is very useful to be able to test circuits and devices before permanently installing them. The pin headers are installed facing upwards in the outer rows. I also often install male pin headers facing down in the inner row. The inner and outer rows are connected, providing me with two ways to connect a device to a pin. This also allows me to simply plug the Propeller Platform directly into a bread board for prototyping. This is a red version of the Gadget Gangster Propeller Platform, but it functions the same as the Blue Gadget Gangster Propeller Platform or the DNA. Direct connections to the breadboard mean less loose wires. The pin headers are also used to attach modules to the Propeller Platform. Traditionally, modules connect to the top of the Propeller Platform by mating the upward facing female pin headers with downward facing male pin headers. I recommend creating your own modules to connect the Propeller Platform to an apparatus. This leaves the basic Propeller Platform unmodified and free to be used with a variety of other modules or experimental equipment. Below you can see a module I created primarily to connect the Propeller Platform to an apparatus. The module also provides audio and video RCA connections. The Propeller Platform installed on the module. Note that I have easy access to the μSD card socket and the female pin headers can still be used for prototyping. This module attaches to the bottom of the red Propeller Platform. The wires go from the pin headers to another pin header on the bottom. Bottom of the module. This pin header now connects to pins on the Propeller and fits the parallel interface of the I/O board. At the moment, I prefer installing modules under the DNA to keep the top pin headers free and to provide easy access to the μSD card slot. An alternative method to keeping the DNA on top would be to install the female pin headers facing down. You could also install right-angle male or female pin headers to connect devices to the side. It is really a matter of personal preference. After some breadboard prototyping, you will likely want to remove the clutter of wires. Testing two Sensirion SHT1x temperature/humidity sensors using the Parallax 2x16 LCD screen. Testing a handful of solenoid valves using a ULN2803A Darlington Array. As you can see, the number of wires and connections can quickly become overwhelming. After a design has been well tested, it may be time to create a permanent connection. Although you can have your own printed circuit boards design, you will more often use some form of protoboard (sometimes known as perfboard). You can find a variety of protoboards, pin headers, sockets and other useful parts at sites such as Parallax.com, Adafruit.com and Sparkfun.com.